You’ve eaten dinner. There’s a noise outside. Someone or something is out there, possibly stalking you? Most likely it is a raccoon rummaging through your trash, helping himself or herself to any number of tasty items from your previous day’s meals. If you live in the Neotropics (South and Central America), then it is probably a coatimundi, one of the raccoon’s tropical cousins. raccoons are enthusiastic trash collectors. These masters of finding tossed-out goodies in your trash can, rubbish bin, or compost heap are members of the taxonomic family Procyonidae. Raccoons, more than other members of the family, seem to be able to live almost anywhere, though they are more common in forested and wetter areas. They are so adaptable that in some areas (yours?) 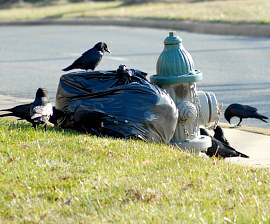 they become a nuisance to people, mainly when food - in the form of garbage, pet food, gardens, or even loose chickens – is freely available to them. 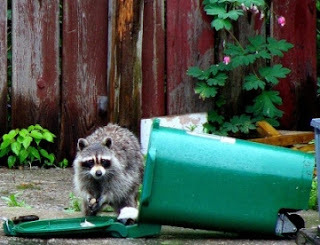 Your best bet to avoid conflict with a raccoon (family) is to keep garbage tightly covered, keep pet food and water indoors at night, and keep your garden fenced and your chickens closed up for the night! 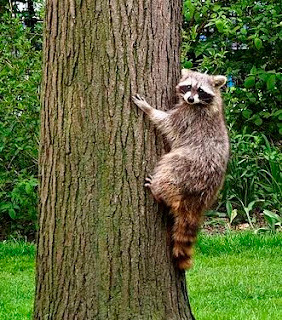 This eHow page gives specific tips for keeping raccoons (the “Houdini of the animal kingdom”) out of your yard and garden. The idea of playing talk-radio in the garden at night is particularly creative. caught! backyard raccoon makes a getaway. But of course there is more to the raccoon family than just raiding garbage and gardens! Raccoons have some evocatively-named cousins: in addition to the coatimundis, the family includes kinkajous, olingos, ringtails, and cacomistles. 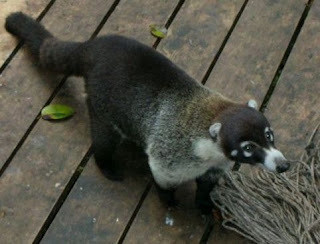 While the more opportunistic raccoons and coatis thrive on our trash, these other species live mainly in tropical forests and are generally timid around people (though even some of these have become pets). It’s impossible to visit a penguin colony without saying “awhhh” out loud, repeatedly. We recently got to observe the Stony Point African penguin (Spheniscus demersus) colony, at Betty's Bay at the tip of South Africa. note my short, stiff wings, webbed feet, & dense feathers penguins are social and curious! Penguins are enormously endearing, in part because they are curious and show minimal fear of humans and in part because on land they seem to struggle with every step. But of course, penguins were not built for extensive land travel*. This becomes obvious if you see them either: a) on land or b) in the water. As humans increasingly dominate all regions of the Earth, animals and plants that can adapt to our presence (synanthropes) will like enhance their fitness. I will highlight some of these groups or species, as well as their less fortunate counterparts that are particularly sensitive to human alteration of natural environments, either because they need a lot of area or a certain habitat or landscape feature to survive and breed. A first synanthropic example, common to both temperate and tropical regions, is the crow family (crows, ravens, jays, etc -- called Corvids), which like pigeons (rock doves), live happily in human settlements in all continents except Antarctica. Writer Joshua Klein has even given an entertaining TED talk on crow intelligence and adaptability, with a call for us to work better with synanthropic species. For a great description of the smarts and flexibility of corvids, have a look at this article in the the blog Endless Forms Most Beautiful. they are smart! Crows and their relatives pass laboratory tests of self-recognition, recognition of individual human faces, flexible thinking, and overcoming of impulse to gain a greater, though delayed, reward. 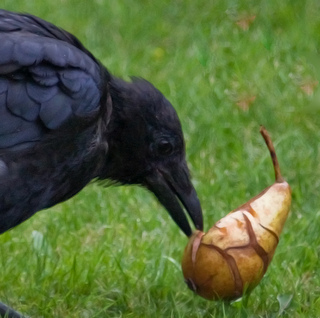 The article is great and cites both fun amateur videos and scientific studies on corvids that demonstrate that crows are smarter than your average beast, and they've been hugely successful because of it. OK, not really, but a fun follow-up to the last post! 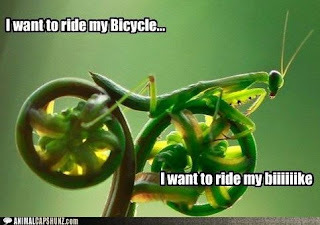 I thought this combination of mantis and fern fiddles was both lovely and funny. This one just reminds us of the importance of teamwork. How bike commuting can change your life! I hadn't seen this site previously, but he's enthusiastic, even in the snow! (The site details his journey into bike commuting and the benefits he's gained). Leave when you want to? Bicycle commuting may be for you! The health benefits of physical activity are well-documented (long report, start at page 25), with morning exercise providing special fat-burning benefits. You get in a workout before you even arrive at work, which wakes up both body and mind, and may make your time at the office more productive. Commuting by bike may improve your mental wellbeing as well by adding some fun to your workday! 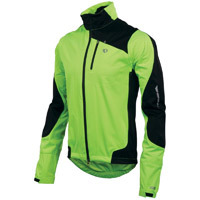 Some bike commuters simply wear their work outfits, while others make the ride wearing any number of cool, shiny, tight-fitting biking shirts and shorts. 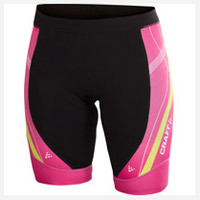 While clearly not required, these items keep you drier and more comfortable when riding. 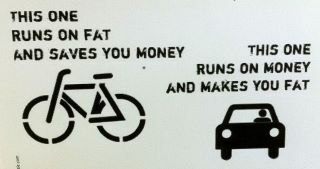 Plus, they might motivate you to bike more often, which, in turn, saves you having to buy and burn gas for your commute. The top bicycle commuting city (in percent of work force) is Copenhagen, Denmark, where over 35% of residents commute by bike, despite the city's cold wet winters (Denmark's gas price of $7/gallon likely encourages more cycling but numerous functional bike lanes facilitate biking). Danish statistics show that every 6 miles biked instead of driven saves 3 1/2 pounds of carbon dioxide emissions and 9 cents in health care costs. 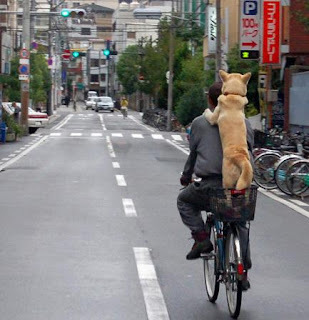 But many cite happiness among the chief benefits of bicycle commuting - they feel better after biking. I enjoyed my daily cycle to my office while studying in the UK and grew more relaxed driving on the left side of the road there. Cycling allowed me to zoom from my front door right to my building, and from my building to shops (or pubs) across town, sometimes using a cycle/pedestrian bridge or other pathways unavailable to cars. Once downtown, parking a bicycle was noticeably easier and cheaper than finding a spot to park a car. Until recently, cycling was the main mode of transport in Beijing and other Asian cities, but they are becoming increasingly dominated by cars, with the associated dense traffic and pollution. 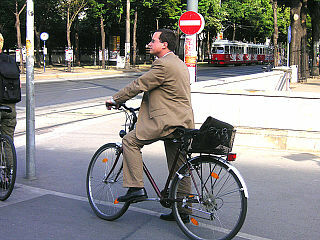 A University of British Columbia professor studying cycling in Beijing found that bicycle use in Beijing dropped from around 60% in 1986 to 17% in 2010, while car use has been growing at 15% per year. Trading one's bike for a car symbolizes arrival in the middle class, which is important enough now in China for people to buy expensive and cruelly and illegally-harvested ivory, so it is a trend to pay attention to. 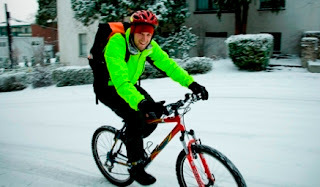 Of course not everyone can cycle to work – extremes of weather, distance, equipment needed, and road conditions all hinder the would-be bike commuter. I’m currently living in Bangkok, where I would be terrified to ride a bicycle to work. The traffic on any large street is always choked up and often intolerable, and it includes drivers that create lanes where there are none. 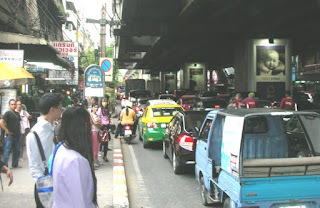 Midday traffic at Phrom Phong, Bangkok, (note the moto taxi creating his own lane at the left). Where do you go with a bike? Roads that resemble parking lots most hours of the work day goad motorcyclists into creating their own 3 distinct mini-lanes: one between the curb and car in the left lane, one between the left and right lanes, and one between the right lane and center line of the road. 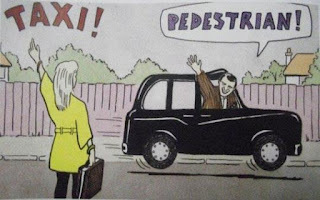 BTW, despite their sometimes creative or daredevil use of the road, taxi drivers in Bangkok are generally a decent and easygoing sort. (Plus they almost always have proper change and will usually offer it. The first driver that lacked change of 100 baht (about US$3) let me go without paying, rather than take more than the fare. 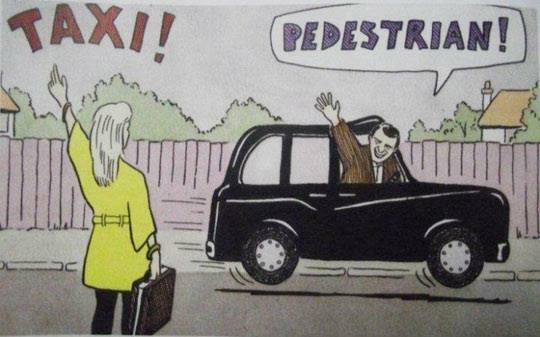 A long-time Thai expat suggested that maybe the driver was improving his karma by being generous). Bicycling.com which has basically everything you'd want to know about commuting by bike, including bike skills, safety, gear, as well as cycling in general! Two slightly irreverent sites, BikeCommuters.com and CommuteByBike.com, provide an equally large range of topics, dedicated specifically to bike commuting. Curiously, the New York Times keeps a reference page with a substantial list of resources for bicycle commuting. 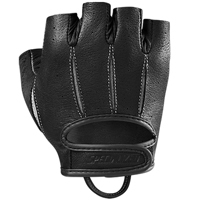 REI (Recreational Equipment Inc) offers various helpful hints on topics like safety and (as expected) cool gear for different types of commutes. For motivation from a slightly more technical source, you can view a 2010 study from the Journal of Physiology on training in a "fasted state" (i.e. before breakfast!) to combat a fat-rich diet here. For a long-term perspective on health benefits of bike commuting, an academic study (in the journal Environmental Health Perspectives) attempted to determine quantitatively whether the health benefits of using a bicycle instead of a car for short trips outweighed the health risks (mainly pollution & accidents). This study calculated potential "benefits" in terms of the gain or loss of "life-years" using data from long-term studies of exercise and of exposure to typical traffic pollutants and traffic accidents. Apparently, the estimated overall health benefits of cycling are substantially larger than the risks, relative to driving. Commuting by biking instead of driving increased life expectancy. Specifically, the authors estimated that the increased physical activity due to the switch to cycling resulted in about 9 times more gains in life-years than the losses in life years due to increased inhaled air pollution doses and traffic accidents. On the plus side, the increased physical activity from shifting from car to bicycle adds approximately 3-14 months to the life of the new bike commuter (lower body weight, lower risk of heart disease, etc). On the minus side, the risk of accidents and pollution inhalation was higher for cyclists than for car drivers (although this included long-distance trips, which for cars are statistically safer than short trips). On average, the increase in inhaled air pollution doses resulted in an average loss of 0.8–40 days to the commuter's life, while the increase in traffic accidents resulted in 5–9 days lost. The study also considered benefits to society, which were even larger because of a modest reduction in air pollution and greenhouse gas emissions and traffic accidents. Do you have some motivational (or funny) commuting tips or stories? On a wonderful visit to Serengeti National Park in Tanzania (go there if you can - you will not regret it! ), we spotted what had to be a newborn elephant. Clean and dry, but darker and so tiny! Elephants are huge. A herd of elephants is an impressive sight. 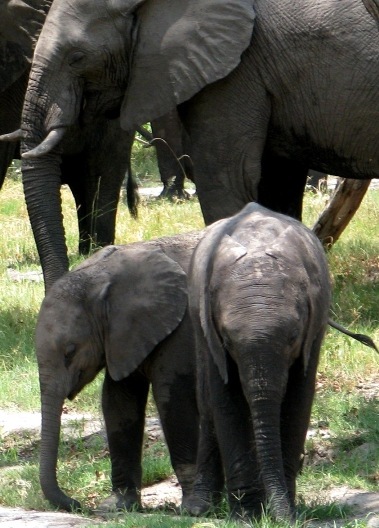 But new baby elephants are relatively tiny, weighing around 110 kg (or 250 lb), just 5% of their mothers’ weight, and so are vulnerable to predation from lions and hyenas. They can’t run away and lack any self-defense mechanism. But they have Mom. And Grandma. And Sister Ekela and Aunt Elene. 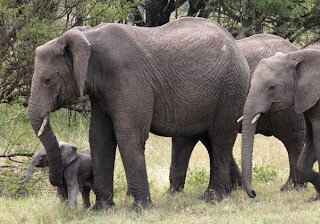 Baby elephants stay with their mothers even after they are sexual mature (6-10 years), and are not even weaned until they are 4-5 years old (growing tusks apparently become a nuisance to the nursing mother, a fair reason for weaning!). During this time, the young elephants learn about their home terrain and its resources (food, water) as well as social norms of the herd, but not just from their mothers. 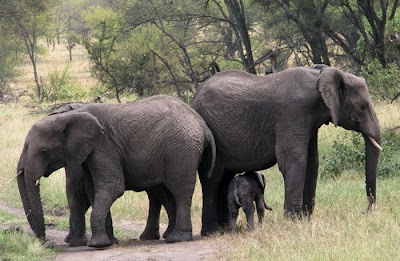 Elephants practice allomothering (“allo” meaning different): that is, adult females without calves of their own will help guide and protect the young of their relatives in the herd. They care for, comfort, protect and watch over (“babysit”) others’ calves, accompany the young ones while traveling, and even allow them to nurse in some cases. Relatives help with rearing young not only in elephants, but also social insects like bees, pack animals such as wolves or jackals, and, of course, primates, including humans. 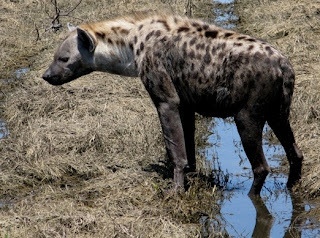 Allomothering, also called cooperative breeding, frees the biological mom to rest and to eat enough to keep up her strength and milk production, yet it slows the allomother’s feeding efficiency, so it has a cost to her survival (potentially decreasing her fitness). Why do they do it? 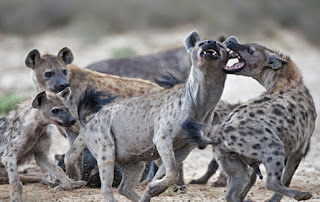 The other females in the herd or pack are usually closely related to the real mother and the little one, and are often nulliparous, that is, they have not yet given birth themselves. By helping their sister-aunt-mother, they enhance their own inclusive fitness by improving the chances that the baby, which shares a high portion of its genes with the allomother, will survive and reproduce. 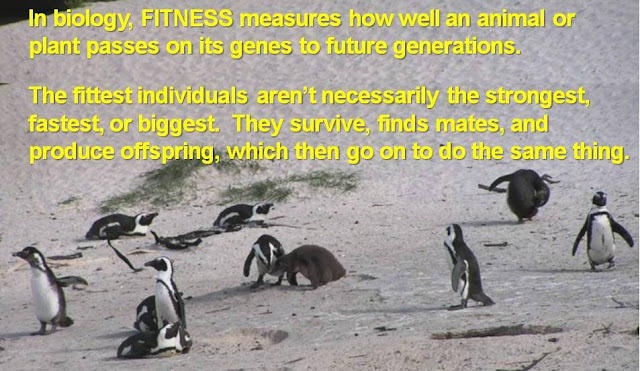 Remember that fitness involves passing on one’s genes to the next generation, so allomaternal behavior makes sense among animals that are closely related by allowing them to improve their broader fitness even before they have their own young. Thus the tight formation of brawny, motivated females staring back at us, surrounding and protecting the lone half-pint peering out from the middle. When they decide that another animal (usually a lion), or a group of human tourists, is a potential threat to a newborn, elephant females – mom, sisters, cousins, aunties – will circle around the little one and face outward, tusks held high. There is a low soft rumbling that lets you know they are onto you. This is not a greeting, and the oversized rugby team in front of you displays its solidarity for a common cause. The little dude or dudette in the middle that is the cause of this commotion is likely oblivious to the threat, but follows orders and stays put. This video and this one, among others, give a sense of their superb organization. We seriously enjoyed the teamwork of this herd as much as the antics of the little ellie still trying to figure out how to manage its trunk. Like us, young elephants mature slowly, and it can take over a year to fully learn to use their trunk. 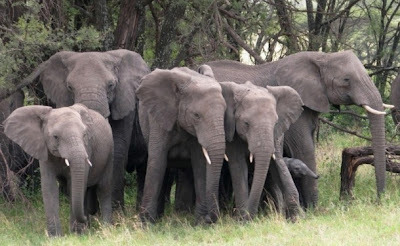 Elephants are probably my favorite animal: they are smart, social, gentle when not harassed, and now under considerable threat from human greed, ignorance, and desperation, so I will add more posts on them in the future! Gadgil, Madhav; Vijayakumaran Nair, P. 1984. Observations on the social behaviour of free ranging groups of tame Asiatic elephant (Elephas maximus Linn). Proceedings of the Indian Academy of Sciences - Animal Sciences, 93 (3). pp. 225-233. ISSN0253-4118. Hrdy, S. 2001. Mothers and others. Natural History Magazine online. Adapted from a University of Utah Tanner Lecture entitled, “Cooperation, Empathy, and the Needs of Human infants”.